In 1598 Don Juan de Onate led Spanish colonists to the upper valleys of the Rio Grande. Franciscan monks followed the colonists to minister Christianity to the Indians. This area would later be known as El Camino Real. The Franciscan monks who settled there needed to hold daily mass; central to each mass was wine, which represented the Blood of Christ. The monks needed a local source for their sacramental wine since the nearest supply was several months travel. In this region of the Upper Rio Grand is where grape vines were first introduced to New Mexico. Before grape-vines were planted in New Mexico the Franciscan monks had wine shipped from Spain. The Sacramental wine was light pink in color, had a sherry-like taste, was 18% alcohol, and 10% sugar. The wine was transported in heavy jugs resembling those in Roman times - The stoneware jugs held approximately 2.6 to 3.6 gallons each and were sealed with a cork or wood plug. The jugs needed to be sealed with a green glaze, applied to the inside of the jug. This glaze would have contained lead that leaked out into the wine during prolonged exposure to heat or to the acid in the wine. Grape Vine planting was hindered by Spanish Law which in 1595 forbid the exportation of Spanish grape vines to protect the Spanish agriculture industry. At the time Spanish wine exports provided one fourth the foreign trade revenue of Spain. Franciscan Monks chose to ignore this economic law and smuggled vines out of Spain into New Mexico around 1629. Fray Gracia de Zuniga, a Franciscan, and Antonio de Arteaga, a Capuchin monk planted the first vines at a Piro Indian Pueblo just south of modern day Socorro New Mexico. The cuttings brought by the missionaries were of Vitis vinifera, commonly called the "mission grape". This variety is still grown in New Mexico today. numerous events took place which threatened the foot hold of the wine industry in New Mexico. Several pueblo revolts and hard winters threatened the grapes, but by the 1800's New Mexico had immerged as wine country. New Mexico became a territory of the United States. 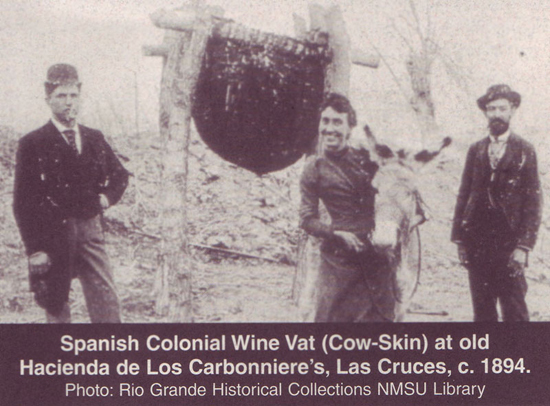 Jesuit priests settled in New Mexico and brought their Italian wine making techniques and founding a winery in 1872. New Mexico produced 16, 000 gallons of wine by 1880 New Mexico produced 908,000 gallons! census indicated that New Mexico had twice the grape vine acreage of New York, a more developed state. New Mexico was fifth in the nation in wine production: almost a million gallons annually. Decline of Wine Production in New Mexico. In the 1900's at the turn of the century New Mexico experienced extensive flooding. In 1926 the first Rio Grande flood occurred that impacted the vineyards throughout the grape growing region, from Bernalillo to El Paso. Prohibition began in 1919 and only a small amount of medicinal alcohol could be legally produced and sold. Though the sale of wine was hindered, the grape vine acreage doubled between 1920 and 1930. In 1943 the largest Rio Grand flood of the century destroyed vineyards throughout New Mexico. Vineyards that had been producing wine for fifty years were destroyed. What remained of the old commercial wine industry in New Mexico never recovered from these floods. Rebirth of the New Mexico Wine Industry. By 1978 small wineries opened up creating wine from mostly French-Hybrid varietals. These cold hardy grape vines prospered in the North. By the 1980's production of wine was up and a rush on New Mexican vineyard land began. The rush was lead by a group of European investors who were attracted to New Mexico's still underdeveloped wine market and inexpensive land. Between 1982 and 1983 2200 acres of vineyards were planted around Las Cruces. Many more vineyards and extensive acres of grapes were planted until present day. The largest vineyard in New Mexico, New Mexico Vineyards, belongs to Luna Rosa Winery in Deming New Mexico. This history is an excerpt from this book.